When most people think of tile in Denver, what leaps to mind is a polished surface. For that glassy, architectural magazine or interior design website photo spread, this is the kind of popular look you always see. However, travertine has another look entirely, tumbled, that could be the tile that sets your Denver area home apart. Travertine is a form of limestone. It is created when minerals have dissolved into the groundwater and are then gradually deposited by natural springs and rivers back above ground. Like the entire natural stone tile selection we carry in Denver, travertine is quarried in large blocks that are eventually reduced to the tiles we sell. 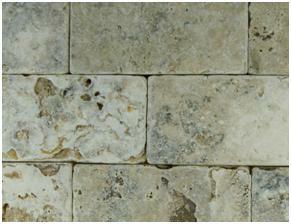 Travertine has been used as a design element for thousands of years in the Mediterranean basin. The timeless look of travertine tile isn’t based on polished tiles, which are sometimes confused with marble by the untrained eye. Rather, it is the brushed or tumbled finish that made travertine’s reputation for beauty, especially as flooring. Tumbled travertine looks like it has been aged with time, but in a good way. Even when brand new it conveys an air of antiquity and a connection to the Classical World. The “artifice” in a highly polished tile layout cannot achieve the “well worn” look that a tumbled finish can carry off. Tumbled travertine tile may not be for obsessive personalities. The rougher finish produces many surface irregularities that look like ordered chaos compared to the cold uniformity of polished tiles. What this chipped looking finish represents though is ultimate versatility. In the event of damage it is so much easier to “mostly match” a tumbled travertine tile for color and finish than “exactly match” a highly polished one. Another major strength of the tumbled finish travertine tile, especially in Denver where we are not necessarily limited by the square or rectangular rooms of history, tumbled travertine tiles are easy to cut for difficult spots. The finish already being scuffed and chipped looking on purpose means it’s simple to create oddly shaped pieces compared to a polished tile, where any chip at all is at best something to be covered up by a transition or trim, and at worst the waste of a tile. Finally, tumbled travertine tiles offers at least some friction underfoot when wet, unlike an unforgiving polished tile. For samples or more information on tumble finished travertine tiles, contact us.